2013 Panini Disney Princess Style stickers bring together all the leading ladies of the Disney kingdom. Ariel, Snow White, Belle, Jasmine, Rapunzel and more show what it takes to be animated royalty. The 2013 Panini Disney Princess Style collection has a total of 240 different stickers. The majority are basic glossy stickers. However, there are several levels of special ones as well: 12 satin stickers, 24 glitter stickers and 24 foil stickers. 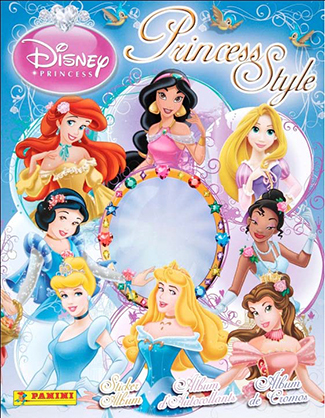 The 48-page color album that accompanies it includes a poster that can be used to decorate any little princess' room. 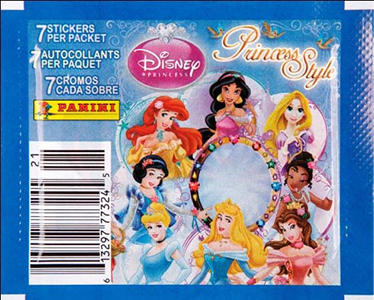 2013 Panini Disney Princess Style sticker boxes come with 50 packs. Running about a dollar, each has seven stickers. Combo boxes come with 100 packs and 20 albums. DISNEY PRINCESS OVEN MITT CINDERELLA & PRINCE CHARMING CHILD'S OVEN MITT -9 1 2"
My sister totally loves Disney princesses. I will look forward to this! About the Panini Disney Princess Style 2013 you advertise……is it $1.00 per Box, or per pack? Because the way you explain it, You sell the Box for a $1.00 and I want to buy it that way, or you have misrepresented, the price? What is the story on that? I have an un-open Box of them and it has 75 Packets; 15 Albums and 1 display case…..that is used to sell them in a store……….is the whole box only worth a Dollar? I don’t know….you tell me, please? Thanks.